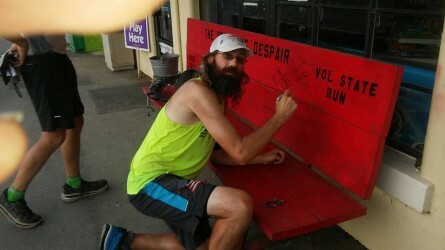 Tag Archive | "Jeremy Ebel"
Before the clock struck 6 completed days three more Vol State 500K runners reached the rock. 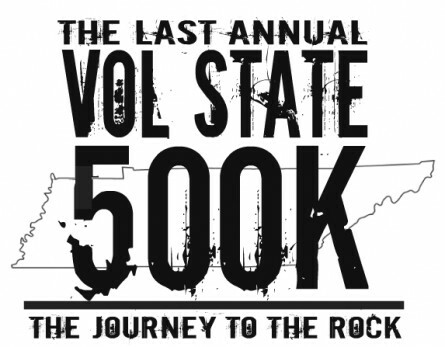 Congrats to Jeremy Ebel, who got lost at one point and added 20 miles to his race, Andrea Stewart, who is the 3rd woman to finish and 1st uncrewed woman to reach The Rock this year, and Jay Dobrowalski on his 2nd Vol State 500K finish. Richard Westbook called it at mile 257 becoming the 20th DNF of the race. Yesterday and last night were brutal, our roughest day yet. We got some good sleep this morning to try and let our bodies recover some. We were two pitiful souls coming into Shelbyville. 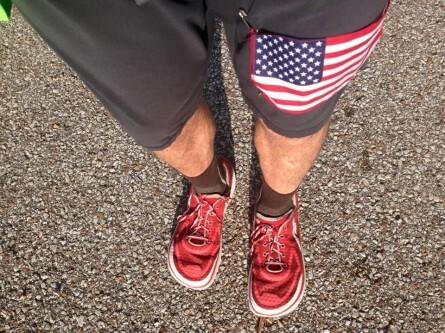 James Adams (above) has reached Kimball, TN and is a little over a half marathon from The Rock. but the worthy tales have not all been spun. the most dramatic dramas have not yet played out. still occupy that other real world. the world where all that matters is food and drink. where sleeping indoors is the height of luxury. every runner still on the road has a story. and every story is worthy of telling. and many I will never know. no one came here from a vacuum. they did not spontaneously generate on the ferry. the sort we see around us every day. and those who remain are the select. they have paid a price in pain and fatigue. the arduous journey to the rock. than many will live in a lifetime. can only be stopped now by injury. the ones with surrender in their hearts are gone. and oh, the stories they have to tell. the stories of life on the open road. and the rock beyond the reach of their imagination. of the surprises that wait around every bend. and the impersonal cruelty of the beating sun. we unworthy followers get to share in the passion. they get their moment on the throne. when their stories are the center of attention. to hear the stories only they can tell. but the individual stories can only be told by those who have lived them…. I need to take a quick shower. and I want to be there to hear them. 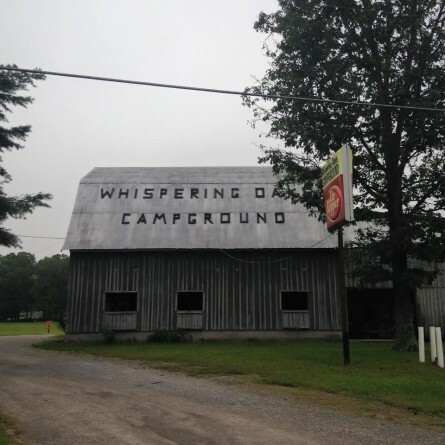 Shane Tucker reached the Whispering Oak Campground earlier this morning. He is well past it now. 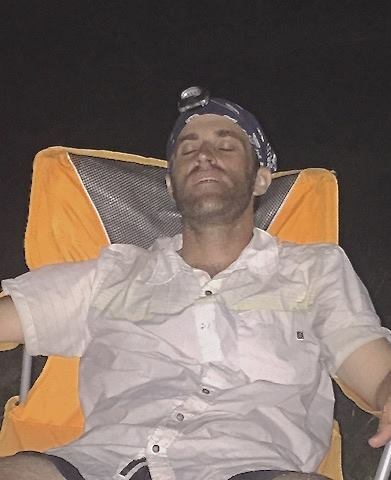 Shane Tucker’s crewmate Julia Beavers caught the above VS500K runner catching sleep in the most strange of places. 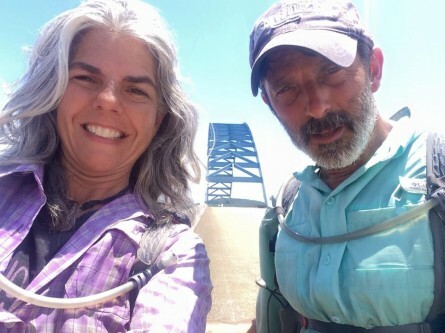 Karen Jackson and Bo Millwood have crossed the bridge in South Pittsburgh and have less than a half marathon to go to the finish. 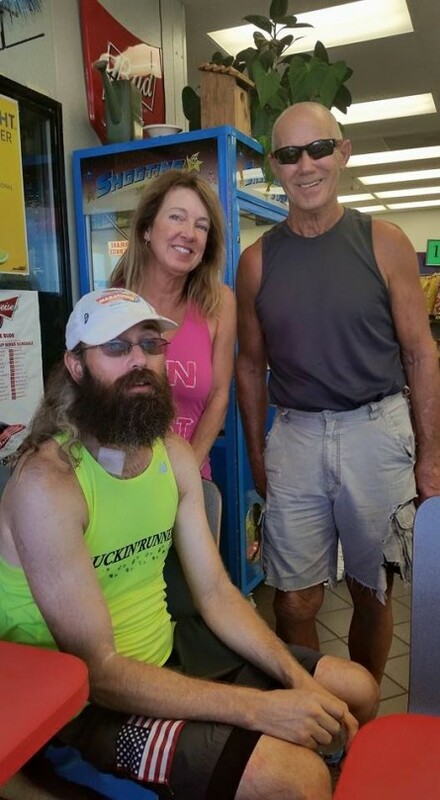 James Adams has finished in 6 days 5 hours 47 minutes 12 seconds and upon reaching the Rock said, “I wasn’t expecting it to be that difficult.” Congrats to James who is from the United Kingdom. Shane Tucker has hit 257 miles and is heading in for the day to get some beef and catch some sleep per his crew. Photo from yesterday via John Fegyveresi of the Canadian duo of Marylou Corino and Lisa Van Wolde finishing the Vol State 500K. And the great Sal Coll is done in 6 days 8 hours 4 minutes 25 seconds. 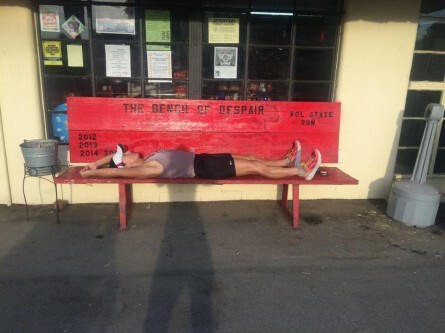 “Oh man I’m glad that’s over.” It’s Sal’s 4th Vol State 500K finish. Congrats on an amazing accomplishment. #RunItFast tough! 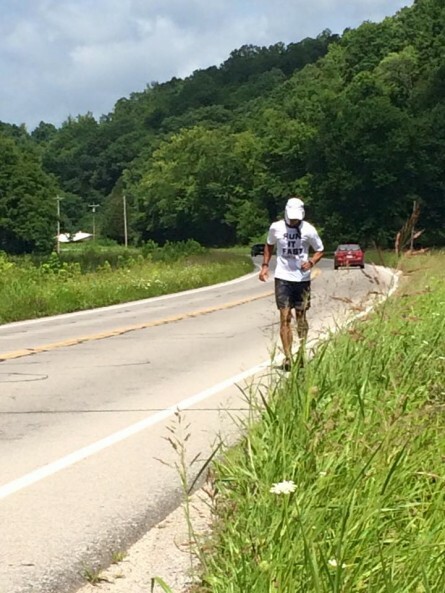 Scott Krouse is to the top of Monteagle mountain, mile 273. 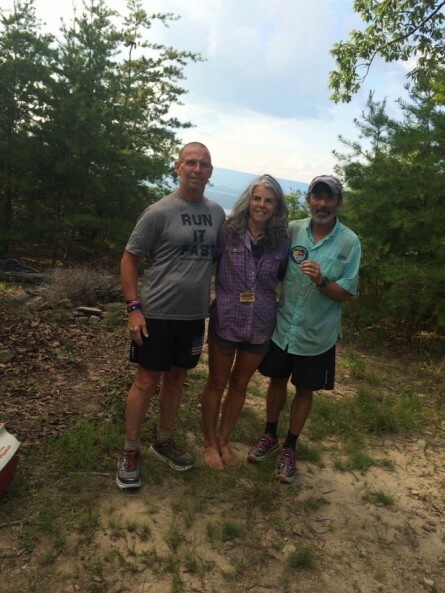 Run It Fast’s Sal Coll (above) 4x Vol State 500K finisher…amazing! Photo above of 3rd place finisher John Fegyveresi after an amazing uncrewed Vol State 500K run at the Rock in the ‘thrown’! 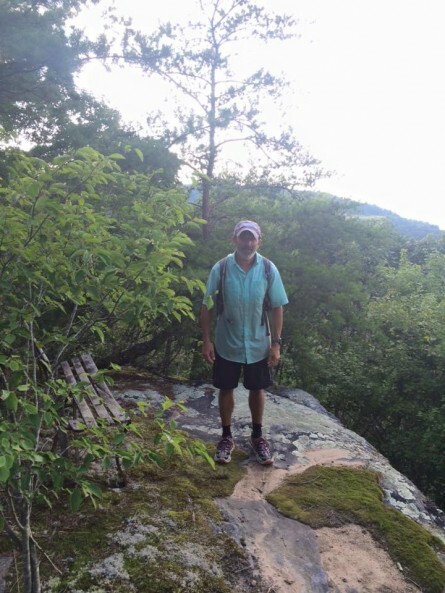 Bo Millwood on The Rock after finishing the his first Vol State 500K with Karen ‘Action’ Jackson. 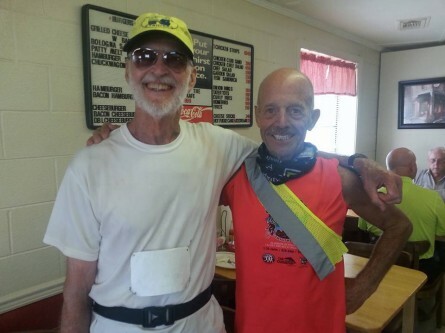 Add Rick Gray to the list of Vol State 500K finishers with a time of 6 days 11 hours 10 minutes 8 seconds. Way to go, Rick! 5 more finishers have reached The Rock since the 7:30am check in this morning. The 156 hour check in included finishes from James ‘Give Me A Samuel’ Adams, Sal ‘4x finisher’ Coll, Bo Millwood, Karen Jackson, and Rick Gray. That brings the total to 14 finishers with 36 runners still on the road. “Day 7, Wednesday, Manchester, MM 252. Feet are shredded! Have no trouble usually. Danger of infection concerns me on nail of big toe. Don Winkley knows a woman who lost foot over similar. He recommended soaking in peroxide. When someone of his experience speaks, you should listen. So, it happened the little mart had peroxide. I did what Don suggested. Lynda Webber has dropped from the race at mile 235. 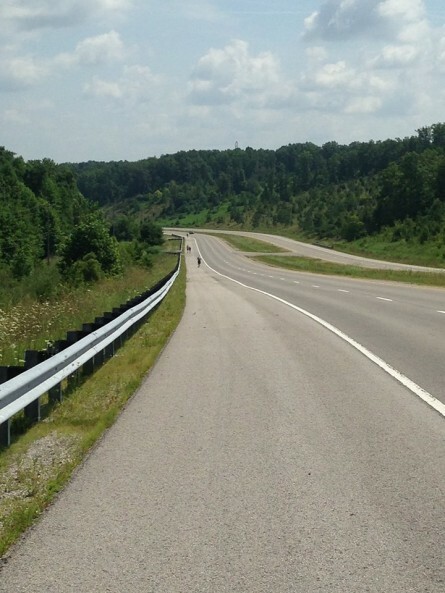 Gregg Ellis currently at 252mi on his way towards Monteagle. Sal Coll, Karen Jackson, and Bo Millwood at The Rock earlier today. Run It Fast members Sal Coll and Shane Tucker taking names around mile 146.
the 4th morning is here. and the vol staters run. over the hills and thru the valleys. and past the places where their comrades fell. three days have taken a toll. and the long thin line grows thinner. and baked by the sun. there is a different resolve now. and the laughter of the ferry. it has been replaced with a grim resolve. oprah is no longer far behind. the runners at the back can feel her hot breath on their necks. they can hear her stiletto heels clicking on the pavement behind them. at the front the thoughts of records ands glory are long gone. now each and every survivor pursues the same goal. press on to the rock. it is hard in ways you cannot imagine from home. they do not have to imagine it any longer. overnight, greg held to his lead. but the stubborn swede will not go away. like a speedy oprah, he is still there. both seem likely to finish sometime between midnight and dawn. but there is a lot of road to cover in the heat today. fegy is now a solid third. and has moved into a tie with ebel for 4th/5th. and are a mere 3 miles further back. and the beat(ing) goes on. 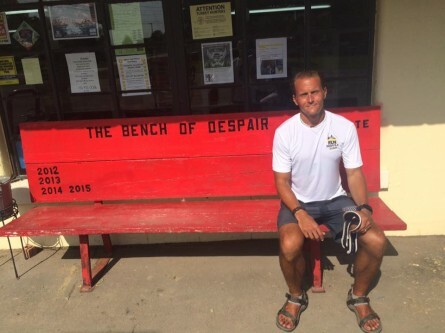 Run It Fast’s Steven Smith vandalizing private property at the Bench of Despair. Kentucky boys never change! “Mile 145, Hohenwald. Few hours of rest and I’m able to put down solid food. Unfortunately, moving with the sun so many long breaks expected during the day. Definitely heat CAT 5++++! 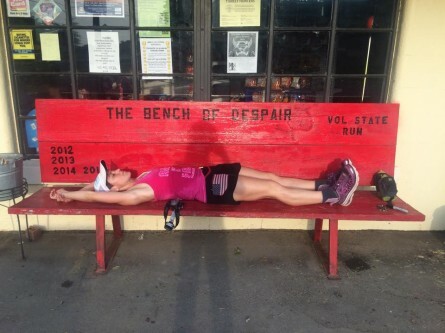 Lisa Van Wolde, tied for top female, tuckered out on the Bench of Despair m180. Marylou Corino, tied with Lisa for top female, with a similar fate at the Bench. Race leader Greg Armstrong is currently at mile 255 according to his crewman Joseph Nance (race time 11:20am). Armstrong rolling on with cracked rib and all! 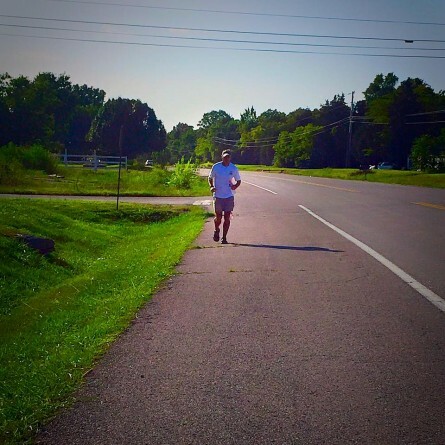 Steven Smith hits mile 200 of The Vol State. Only 114 miles to go. 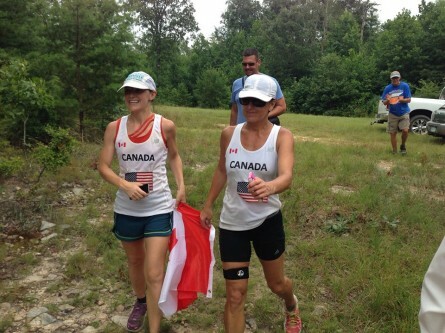 The Canadian women of Marylou Corino and Lisa Van Wolde are at mile 200 in Lewisburg. 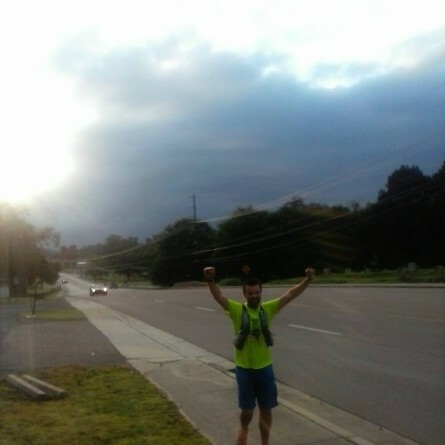 Greg Armstrong is strong once again and banging out 10-11 minute miles as he starts to feel the pull of The Rock a bit as he moves towards Monteagle Mountain. Shane Tucker is to mile 152 where he is now going down for sleep and will get back at it once the sun is down. Race leader Greg Armstrong has turned the volume up to sub 10 min miles and is now at mile 265 with less than 50 miles to go. He is 10 miles away from the base of Monteagle mtn. 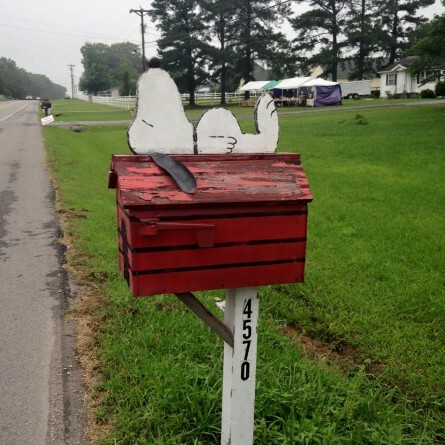 Ben Herron is all thumb on his trek towards Columbia, TN. 84 Hour Update Shortly. Runners are still reporting their positions….several more DNF’s. Armstrong is at 281. Steene 273. After the updated standings were posted, Francesca Muccini who was the third female, dropped from the race per her Facebook update. Congrats to RIF’s Francesca who had an amazing run. Great job, Francesca! 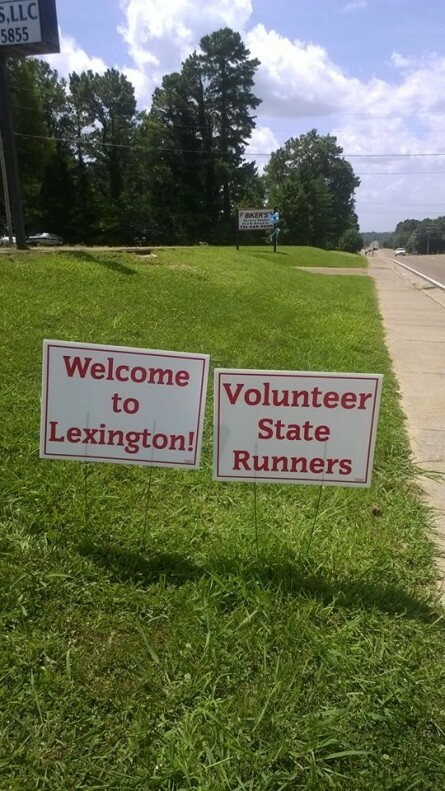 The Vol State 500k has added a new term to the running lexicon, “2 mph.” A speed ordinary runners don’t consider, but every Vol Stater knows. When you have no play left except an enfeebled walk then you make that play. You can endure even that and emerge running the next day. I did. The fever on my quads broke during a deep sleep untroubled by dreams or trips to the bathroom. This morning, I hit US 412 at 4:14 in Parsons. I stopped at 6:30 pm at Hohenwald. The moon is a stingy mistress withholding her light, hanging in the eastern morning sky, offering only a thin smile and each day falling a little closer to the rising sun. When I left Parsons a whip-o-will was calling, second consecutive morning to hear that sound. A chorus of frogs, several kinds, were making their calls, including one that sounded like barking. And a bullfrog was grunting. These hopeful sounds launched me into another burning day. I have a hip hop vibe going, running with my shorts pulled down low, so they can rub a new spot and let the old spot rest. May improve my style category, trotting down the road with drooping britches. I remember a guy two years ago had same problem, but different body part. He wrapped his scrotum with duct tape. Which seemed an imperfect solution. That’s the fate of the uncrewed runner – making do with what he has or he can find. Rich McKnight’s shadow gives the Vol State course a subtle message! Gregg Ellis just hit the half way point (m157). Congrats Gregg! Only 157mi to go! Steven Smith is back on the road after a short rest. He has just 89 miles to go and is currently in 4th place. Couple great photos above from Shane Tucker while cruising through the Natchez Trace Parkway. Armstrong has got to be getting close to The Rock! today was a truly brutal day. and more than a few were pushed beyond their capacity to endure. one by one they capitulated. and many of them are hanging by a thread…. tomorrow promises to be the hottest day yet. and we knew it would happen. the relentless oprah has overtaken a runner. find their backs to the wall tonight. to keep their dreams of reaching the rock alive. of course they are only trying to buy a day. and is running very strong. over a 30 mile stretch of road almost devoid of aid possibilities. I cannot find the words to describe the improbability of this feat. fegy is now totally alone in third. and steven smith has returned from the void to grab a solid hold on 4th. the canadiennes are smiling and dancing along in 5th/6th. to fall out of contention. the first half of day 4 has been a nightmare. now we will see what the night itself will bring. The heat is starting to knock out or severely effect everyone as King Greg Armstrong slowed considerably during the night along with the rest of his pack leading court. Armstrong had 179 miles after the first 48 hours as Day 3 started. Johan Steene had closed the gap to 5 miles back with 174 and John Fegyveresi had moved up to third with 146 miles. Jeremy Ebel is close behind Fegy with 143 miles. The top women remained Lisa Van Wolde and Marylou Corino with 139 miles. Marcia Rasmussen had an amazing night as she moved up to third woman with 125 miles. Francesca Muccini is a bit back at 118 miles. 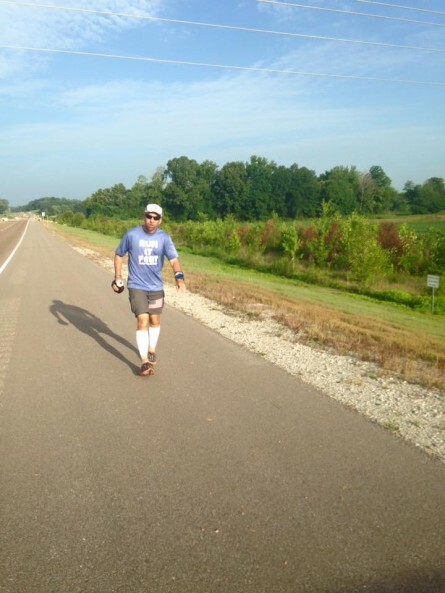 Shane Tucker hits mile 100 of The Vol State 500K. 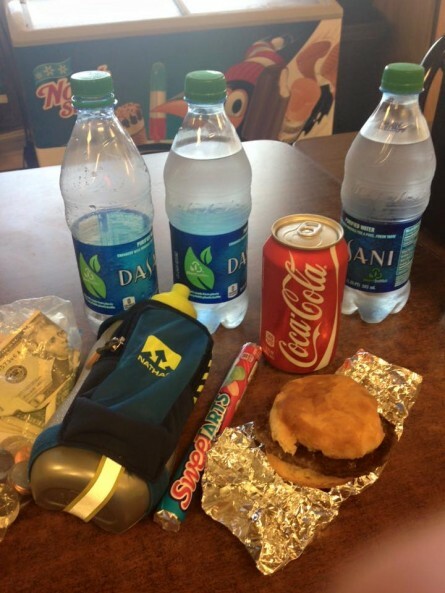 The fuel of uncrewed runner Gregg Ellis getting back on the road. 2013 finisher Diane Bolton caught up with Steven Smith (who looks barely awake/alive) and his crewman Bill Baker. 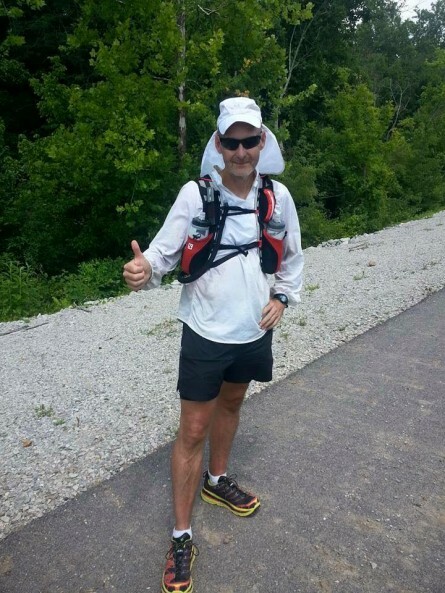 Gregg Ellis hits mile 100 of the Vol State 500K. 214 more miles to go! The locals in Lexington, TN welcome Troy and Cathie Johnson to town! 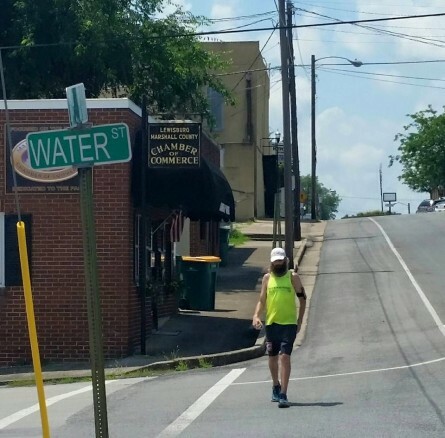 Race leader Greg Armstrong, sporting the Run It Fast colors, during a very hot and exposed part of the Vol State 500K as he approaches Lewisburg, TN. but, the gap between them closed by half. they fight on into the heat of day 3.
fegys took the lead in the chasing pack. but ebel, corino, van wolde, and dobrawalski are all within 8 miles. nothing has been decided amongst them. day 3 stretches out in front of us. a story as yet unwritten. 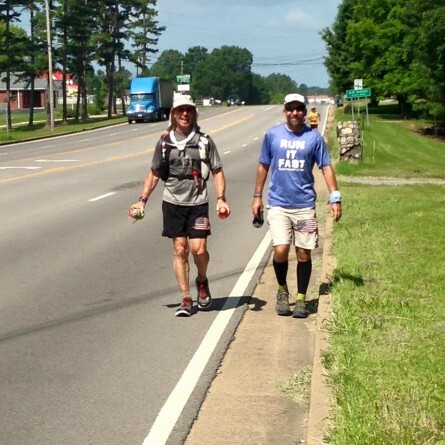 At about 2:30pm race time, Greg Armstrong was at mile 196, 5 miles short of Lewisburg, TN. He’s fighting to get out of purgatory. And the Canadians (current female leaders) Marylou Corino and Lisa Van Wolde ventured off road to find a waterfall to relax in for a few moments. 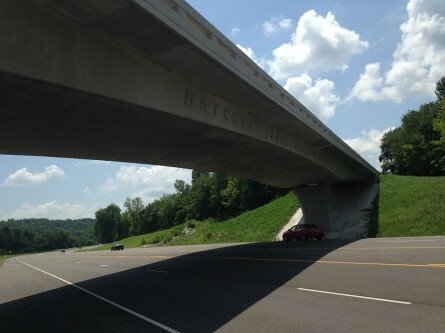 It sounds a bit like a Bill Baker fantasy but this is reality around Natchez Trace Parkway (m157) the halfway point. 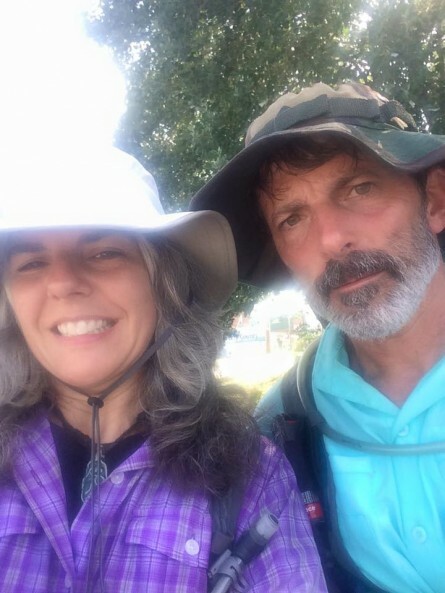 Steven Smith and Francesca Muccini have teamed up, running very strong today with over 35 miles, and are currently at mile 144 in Hohenwald, TN. Marylou Corino with VS500K creator Lazarus Lake! 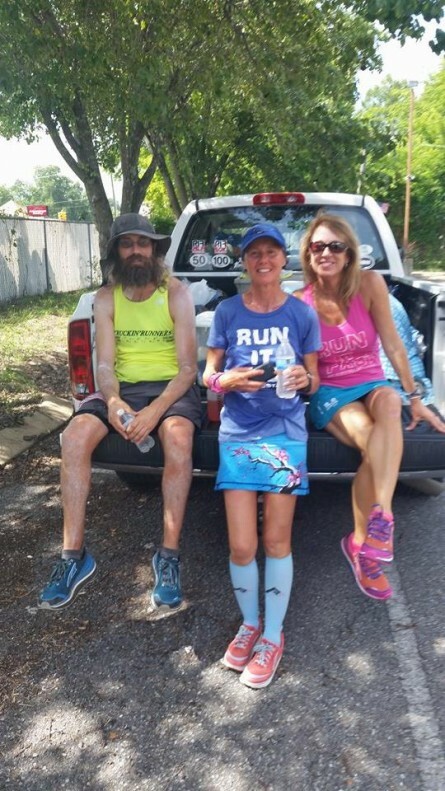 RIF member Diane Bolton caught up with fellow RIF members Steven Smith and Francesca Muccini who have teamed up to put miles down together in the back of Bill Baker’s truck. 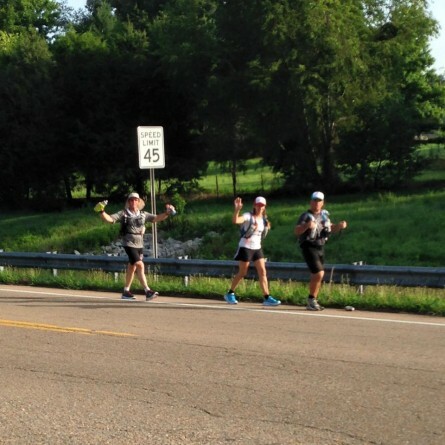 Dallas Smith is very close to mile 100 of the race and less than 10 miles from Parsons, TN. Two more DNF’s as John Rasmussen calls it in Lexington m92 and Marcia Rasmussen calls it in Linden m125. Marcia was third female this morning at the 48 hour check in. So if all else has held then Francesca will be in 3rd behind Lisa and Marylou. Last report on Francesca is that she was moving well with Steven Smith. 60 hour standings coming shortly!! Updated 60 hour standings below for 67 runners. 5 runners did not report mileage yet at 7:30pm check in. Will update when it becomes available. 60 Hour standings now fully updated and complete with all runners! Greg Armstrong came back from the dead and is currently at 214 miles at 60 hours. He put a couple miles on Johan Steene who is 12 miles back at 202. John Fegyveresi continues to be strong and make up ground and is in third place with 177 miles. For the women the combo of Lisa Van Wolde and Marylou Corino have 168 miles. Francesca Muccini is 8 miles back at 160 miles and running strong. Run It Fast members in bold. “Great support out here from the people of Tennessee! They’ve been awesome. We call ’em road angels, they will appear out of nowhere with a cold bottle of water n snacks just when you needed it. All the runners are great too. Everybody is pulling for each other. We are all in the same boat. The heat, blisters, rashes, dehydration, heat exhaustion you name it. a rare connection with the internet at midday. there have been no more calls for the meat wagon. greg was past the bench of despair at 0905 this morning. but is moving well again….or was. I haven’t heard how he is doing since the day started to heat up. he had opened back up a 10 mile lead on johan. to deal with some very personal chafing issues. the gritty swede was back on the road and running strong. there is a huge gap back to fegy. fegy seems to have seized control of third place. he is at least 6 or 8 miles up on Jeremy ebel. but we all know how quickly things can change at the vol state. I saw a van pull over. that had to be a godsend. certainly has changed since my days in the vol state. we were happy if cars just did not run us over! altho I could have easily missed them if they were ducked in somewhere. I think it is more likely they are holed up till the heat breaks. 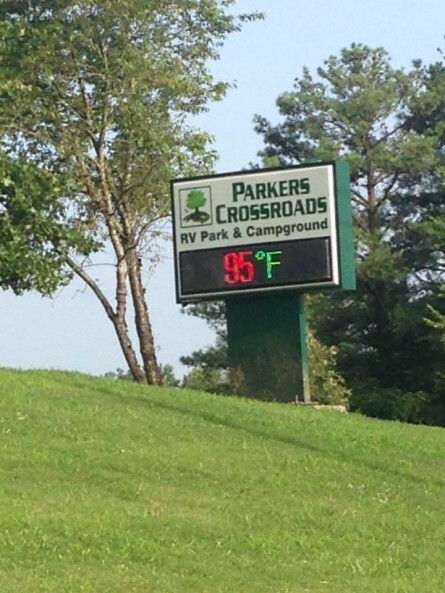 it is already about 95 up here in Hohenwald. among the coolest parts of the course. and up ahead in the Nashville basin. Hit the road at 3:06 this morning. Stopped at 7:46 just now, nearly 17 hours on the road. It was a brutal day on broad roads with no shade. I used 3 hours to go 7 miles! I stood in utter, astonished disbelief. But it was true. A crossroads where I actually was completely fixed my position. I’d gone only 7 miles since leaving Lexington over 3 hours earlier. Forget all the rules. This race rips the heart out of running. I was walking, only, to give my quads a chance to heal from yesterday’s damage – they felt hot and feverish. Still how can you walk that slow? All my clothes are wet. I sit in a towel wrap. No sit-down meal today. About to eat a can of chili because mart didn’t have Beanee Weanees. The Day 2 Vol State 500K coverage starts with a look at the 24 hour standings as everyone checked in at 7:30am this morning. Defending King Greg Armstrong tacked on 52 miles during the second 12 hour stretch for a total of 120 miles after 24 hours. 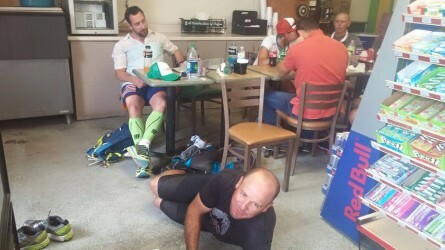 Brian Pickett’s ‘Charge’ died as he DNF’d at mile 78. Sweden Johan Steene took over second place with 107 miles. Third place is now led by first female Sue Scholl with 96.5 miles. Fourth place is Colorado native Jeremy Ebel with 90 miles, fifth, John Fegyveresi with 84 miles and California native Jay ‘Lewisburg’ Dobrowalski has 83 miles. On down the field runners are starting to clump together into pelotons with a big group in the 66 mile range and another around 56 miles. greg Armstrong has taken control,since pickett bailed at midnight. with 120 first day miles…. he is chasing that magic 3-day number. and we are supposed to see the real thing when it comes to heat and humidity. the big news is what happened during the night. was vividly silhouetted against the night sky. 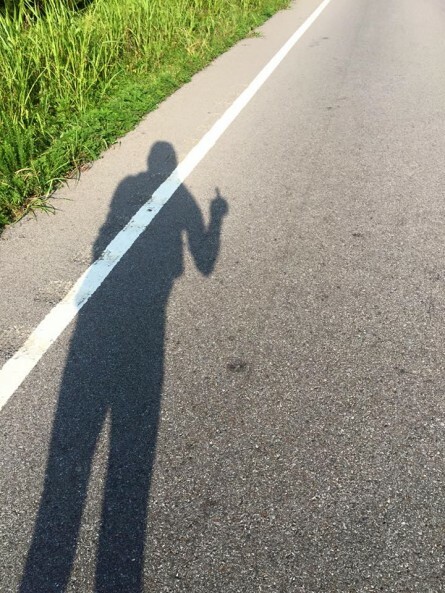 screwed runners can do nothing but go on. but he can’t even relax about winning the screwed division. mighty mite, sue scholl, was only 10 miles back. john fegy is right there at 84.
and jay (endless loop) dobraywalski at 83.
this is going to be an amazing day. and it is time to start taking the full measure. Day 2 temps combined with the wear and tear from the high mileage of day 1 will make it tough for all of the runners as their bodies will want to quit and the remaining distance will haze and taunt them. Vol State road warriors at it early this morning. Current 2nd and 3rd place women Marylou Corino and Lisa Van Wolde. Florida native Michael Melton has dropped from the race as well at mile 54. He simply melted! 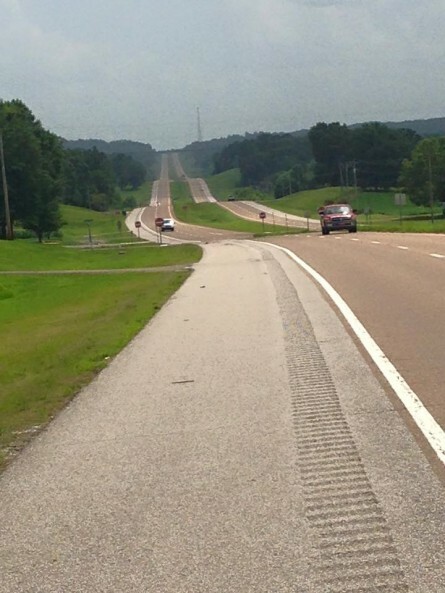 Gregg Ellis thinks the road above seems very long….well it is! Rookie Francesca Muccini is on the heels of Lisa Van Wolde and Marylou Corino. Scott Krouse on Facebook: Ugh…every time I stop I’m cramping, particularly in my feet. I’m used to cramps there, but not this extreme. Killer when you’re trying to sleep. Hot, hot day for Day #2 of The Vol State! RIF’s Dallas Smith with Sergio! 36 hour updates are starting to roll in with most of the middle of the field holed up in Lexington. This post will be updated within the next 90 minutes with complete 36 hour standings. The carnage mounted on Day 2 as 5 runners became road kill. 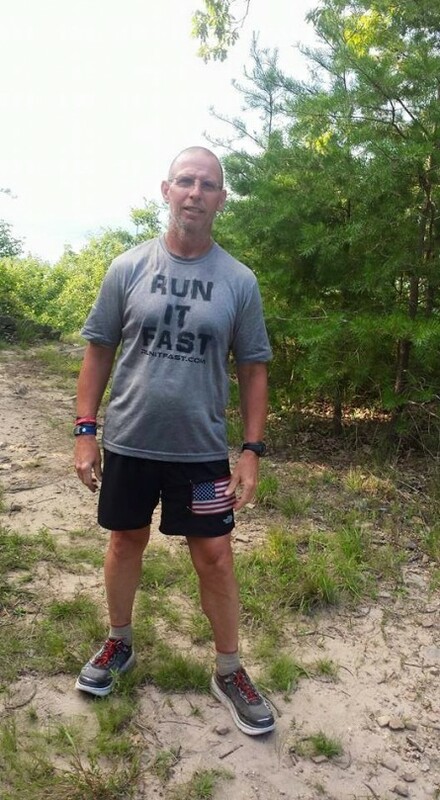 Run It Fast’s Greg Armstrong remains in first with 154 miles at 36 hour check in. Johan Steene is not far behind in 143 miles. Jeremy Ebel and John Fegyveresi were strong throughout the day and now fill the third and fourth spots. 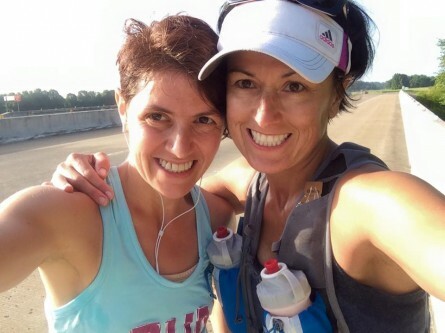 After Sue Scholl bowed out, Lisa Van Wolde and Marylou Corino (running together so far) became the top females with 108 miles. Francesca Muccini is third female with 103 miles. All three women are Run It Fast members. Race leader Greg Armstrong is now at the halfway point mile 157 at 8:40pm local time. Some 37 hours 10 minutes into the race. Well ahead of course record. Johan remains close on his tail ahead of the uncrewed record. got a dose of reality today. and escape the heat for a while. as only 3 more had abandoned their quest by dark. 76 brave souls soldiered on. coming up a mere 2 miles short of halfway in 36 hours. as greg was 16 miles ahead of joe’s 36 hour mark. despite being unscrewed thru the sweltering day. so this should be a very interesting night. and keep the standings in upheaval. the race is only beginning. parsons set up a “welcome center” as did linden. those waiting further along the course can relax. the runners will be passing thru for days. and the runners love Tennessee in return.